Why Have a Gym on Your Yacht? Installing a gym on your yacht will bring two main benefits. First of all you will have a well equipped gym enabling you to continue your fitness regime, even when you are away on a sailing break. The second major benefit is that if you wish to charter your yacht a gym on board will make it much more marketable and you may be able to charge more. So in the long run installing a gym could more then pay for itself in increased charters and return bookings. Most large yachts (or 'super yachts' or 'cruisers' as the term yacht really will apply to in this sense) will have adequate room to house a couple of machines, some free weights and maybe some other accessories. 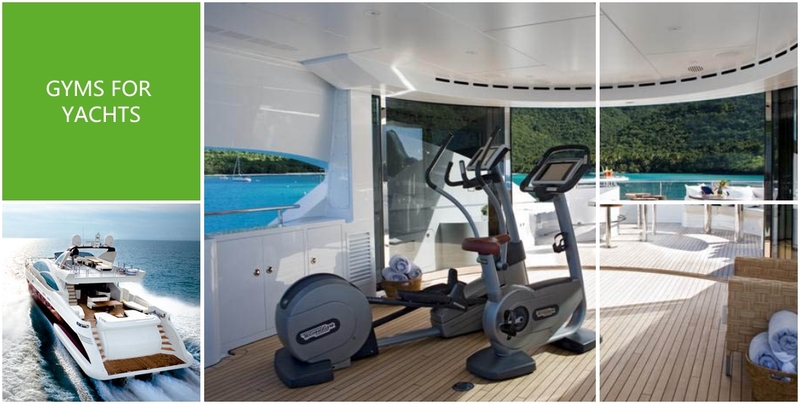 There are a number of things to think about when putting a gym onboard a yacht. Firstly any exercise equipment needs to be especially robust. This is because sea air can be corrosive to certain metals and paints. In addition, the equipment will need to be able to withstand any rough, stormy weather that may occur. Not only does the gym equipment need to be robust it needs to be extremely reliable. The last thing you want is a piece of equipment breaking down or needing a spare part when you are miles away from land. And finally, there is the issue of space. This is always important when installing any gym but onboard a yacht space can be at an even greater premium. The choice of equipment becomes really important here with dual usage equipment offering major advantages. How Can GymEquipment.co.uk Help You? Understanding your needs It is essential that we understand what you want to achieve from your on board gym. Is the gym solely for yourself or do you charter your yacht out for long periods? If it is the later how many people could be using the gym? From this we can design a bespoke gym that is right for your yacht. Maximise your on board space A key issue when putting a gym into a yacht, it is vital that the gym we develop is functional for the space you have. You don’t want your gym to look either overcrowded or simply empty. We will put together a gym design for you that properly uses the space you have. Intelligent equipment selection Another key issue on a yacht, the equipment has to be especially durable and robust and if possible offer dual usages. Clear budget and project management We will guide you as to the budget you will need based on your preferred gym design and will ensure that your budget is well managed. Alongside this you will receive a project management plan so that you are clear about time scales, communication and key delivery dates. Strong technical expertise. We will advise you on what, from our experience of working with yacht owners, is right for you. We will advise on the gym equipment itself but also other aspects such as the lighting, flooring and heating of your gym as well as the overall creation of a stimulating gym environment. In addition to designing and installing your gym we can also help train you on how to use all the equipment. Our unique relationship with the NRPT, The National Register of Personal Trainers means that we can put a personal trainer into your gym at the beginning to ensure that you know how to safely use all equipment on board. We have the expertise to ensure that whatever your budget your money is spent wisely. From the initial design of your gym, to advice on budget and products, we have the experience and technical knowledge to ensure that your gym works for you. We are not tied to any one manufacturer of gym equipment so we can select exactly what we believe is right for you, not what we have to sell you. And finally, our greatest USP of all, us! The person you buy from is the same person who project manages you from beginning to end. This way we develop relationships with our clients based on real trust and understanding. Contact us today, we would love to meet with you and see how we can help develop your onboard gym facility.